If you are looking for good cheap Mexican food, you should check out El Tonayense located at 16th St. and Shotwell. El Tonayense is a big truck that has a built in kitchen. El Tonayense specializes in making tacos and burritos. The food there is very filling, delicious, and perfectly seasoned. The service at El Tonayense is very respectful and courteous, and they bring out your food fast. El Tonayense is conveniently located and roomy, but the surrounding neighborhood is not so pleasant. 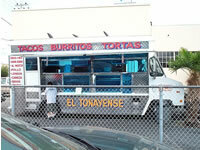 El Tonayense has more than one truck in the Mission District; the main restaurant is located at 24th St. and Shotwell.